"Two Gents workshops are always powerful, creative spaces. We offer workshops alongside every performance of a Two Gents show. over ten years of practical knowledge devising and performing theatrical productions. ​with participants around the world as well. 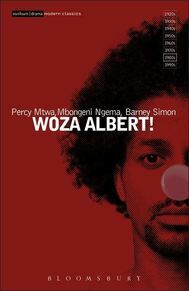 ​“Mbongeni Ngema and Percy Mtwa met on such a township tour of Mama and the Load, a Gibson Kente musical. They both felt the need for further challenges, and in their questioning and reading came upon Grotowski’s Towards a Poor Theatre, and Peter Brook’s The Empty Space. They decided to create a piece and hunted for a subject. One night in their touring bus, there was a heated argument on the Second Coming. What would happen to Jesus if he came back – to South Africa? They began to read the Bible and to improvise. Finally they left Mama and the Load to concentrate on their piece. They approached Barney Simon, Artistic Director of the Market Theatre to collaborate with them because of his extensive experience in Black and non-racial theatre and because of the work that he had done in the creation of texts with actors.